So, what kept me going through two days of testing some great new E-juice products at the London Vape Jam 2015 event, here in the UK, without requiring a re-charge of the battery? Welcome to the latest version of the MVP3.0! After its introduction at the start of this year, many consumers loved the device but wanted to see a version with increased output performance that could fire down to 0.2ohm’s, to house the new Sub Ohm tanks that are currently flooding the market. Taking this on board, and at short notice the R&D team have very cleverly re- designed the original version, added an additional 30W of power, allowed it to fire down to the requested 0.2 Ohms, increased its battery size to a massive 4500mAh capacity with step down technology also included. And if that wasn’t enough introduced the new iSub G to coincide with its release renaming it the MVP3 Pro! For those of you who are fans of the Innokin product line, there is a Gold Limited Edition version coming onto the market as well. So It appears sometimes in life if you ask nicely, and then you get what you wish for, and, in this case, more than! The iTaste MVP3 Pro was sent directly to me from Innokin and arrived in a shrink wrapped and very presentable outer cardboard casing and housed in a robust plastic container with the device located inside it. You have a choice of four colour schemes with the MVP3 Pro, with a newly included premium Gold edition along with the hot Black, Silver, Blue, and of course Pink! Be sure to check you have made your correct colour choice before purchase and opening. Also please verify the warranty period, should any be included with this device before purchasing as well. I believe it is 90 day’s but always check first with your supplier as this may differ depending on your location. Remove either or both of the two stickers holding the upper lid closed, to access your MVP3 Pro device along with the included ego 510 adapter, USB charging cable, and located underneath the foam housing is the manual and included Innokin stickers. The rear contains an overview of the products features, so be sure to read this entirely including the age and health warning before purchase. Colour choices available are Silver, Black, Pink, Blue and a Premium Gold Edition. Precise: RMS-DC accurate to a power deviation of 0.5W and fires from 0.2 – 3.1Ohm. The Voltage can be adjusted from 3.0 – 9.0 volts in .1-volt increments. Wattage can be adjusted from 6.0 – 60 Watts in .5 watts increments. A very long-lasting 4500mAh hour battery that has a diffused tri-color LED battery level indicator on the top. Intelligent: Vape Timer, Puff Counter, Integrated Short Circuit protection, Left/Right Screen Orientation, and a 15 second cut off. The Red LED and Battery Bar will continue blinking when the battery capacity is lower than 3.3V and the MVP3 Pro advanced personal vaporizer will automatically power off. Short Circuit/Atomizer Protection protects the MVP3 Pro Advanced Personal Vaporizer against shorted atomizers and will stop the unit from functioning in unsafe conditions. The MVP3 Pro also features automatic real-time atomizer Ohms detection. If the resistance of the atomizer is lower than 0.4 the Ohms bar will blink and the device will not power on. The MVP 3 Pro is recharged with a Micro USB cable. When plugged into a power source the MVP3 Pro can also be vaped and charged at the same time with Innokin Technology’s Vape while you charge pass-through technology. When the MVP 3 Pro is turned off, it will remember the current voltage or wattage setting and it will retain the setting when the MVP 3 Pro is powered back on. To charge your portable electronic device with the iTaste, MVP3 Pro plug the built-in Micro USB cable into the electronic device and power on the MVP 3 Pro. The included MVP3.0 starter kit charging cable can also be used. Plug the larger USB port into the MVP3 Pro and the Micro-USB into the electronic device and power on the device. You may only charge one electronic device at a time. Do not attempt to charge more than one device at the same time or you may damage the device. Maximum connectivity is made possible with the High-Quality Flush 510 Stainless Steel Threading & Spring Loaded Gold Plated Positive Connector Pin. A top quality Ego adapter is also included. The MVP3 Pro has full tank compatibility and vapes well with all the main, standard 510/Ego e-cig/vaporizer tank systems including the latest editions on offer from Innokin. Every iTaste MVP3 Pro has an easily accessible and unique ID on the board for easy product authentication. 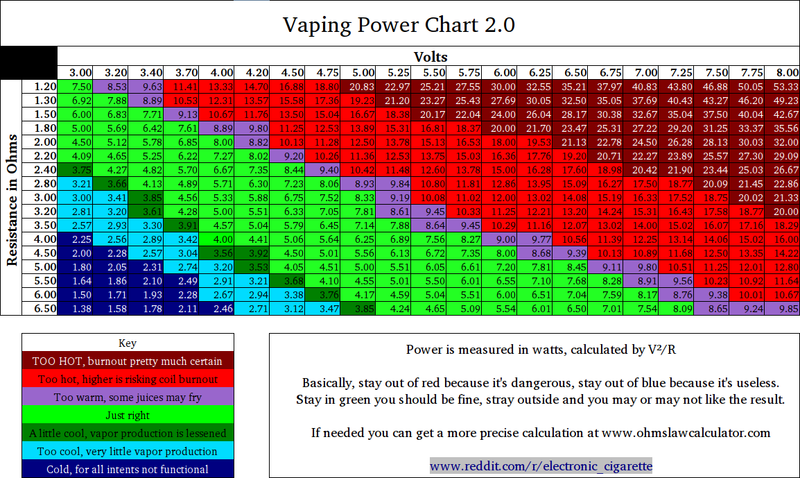 I have used the ranges supplied in this chart for overall consistency, but have also tested the MVP3 Pro’s full range which allows you to vape down to a minimum of 0.2ohm’s & up to a maximum of 60 watts in conjunction with the ACME Vape and Smok GCT, including some absorbing flavoured juices sent to me for review from Mad Mike’s and a new line from the creators of Space Jam which are both gaining in popularity, so a review on both these ranges to follow shortly. The operation of the MVP3 Pro includes the same functionality as you get with the MVP 3.0 but with greatly increased output performance now hitting 60W, with the ability to fire down as low as 0.2 Ohm’s and is as equally simplistic to operate as its predecessor. Firstly make sure you have fully charged your device and press the Power/Fire button three times to turn the device on, or after using it off. If you have not attached an atomizer to the device, the screen will display the error message Check Atomizer. Three clicks in quick succession of the Power/Fire button shows the Innokin logo (Innokin Technology), and you will see a clearly defined layout of the operating functions for the MVP3 Pro starting with the resistance value of your attached atomizer situated on the top left-hand side of the screen. Below this on the bottom left-hand side is the device’s current power output. Centred on the display are either the current wattage or voltage settings and on the far right-hand side is the battery charge status indicator. To select either the wattage or voltage settings to appear in the main display window of the OLED screen just press the Power/Fire button along with the Plus + Button for Wattage Mode, or the minus – Button to show Voltage. Adjusting the value currently displayed is achieved by pressing either the + Button to increase that value, or the Minus – Button to decrease the value between 6W and up to the maximum of 60W, or in the voltage setting 3v up to a maximum of 9v. The MVP3 Pro, just like the MVP3 includes the same time saving round robin function allowing you to switch quickly between a minimum value back to the maximum, without the necessity of scrolling right the way through from top to bottom or vice versa. The MVP3 Pro also includes a puff counter as well. To activate it hold down the + & – Buttons together to view how many puffs have been taken. When the device is powered off the puff counter will reset back to a value of 0. The + & – function buttons also play another role by allowing you to flip the content displayed on the OLED screen to your preferred orientation. Simply hold down both for a few seconds until you see the screen changes its orientation. The MVP3 Pro now has twice the power of the former MVP 3.0 and the ability to fire at 0.2Ohm’s with a truly massive battery capacity of 4500mAh. It should start to appeal to a far more wide-ranging audience including the cloud chasers out there amongst you, and yes it is very capable of producing huge vapour, so I’m looking forward to hooking it up with the iSub G shortly. Performance has been faultless so far due to Innokins attention to detail and by only using the best quality parts in the manufacturing of this device. Built to withstand the rigors of daily wear and tear, this latest edition will give the user endless, reliable, and hassle free performance at a price that’s going to be hard to beat considering what you are getting for your money in my opinion. One further point, I would still love to see a resistance checker situated on top instead of the battery charge indicator! Just received it and this thing kicks big time. For further details on the iTaste MVP3 Pro or any other Innokin product, please visit the Innokin website or contact your local brick and mortar store. Take a look at the new iSub G one of the best designs from Innokin in a long time! I bought the MVP 3.0 PRO starter kit with the ISUB G tank included with 0.5ohm coil…. i absolutley love it! Plenty of cloud and throat hit while retaining the flavour of the eliquid! Word of warning tho, if you are sub ohming (coils less than 1.0ohm i think) DO NOT USE ELIQUIDS OVER 6MG NICOTINE as you WILL overdose or kill your throat and lungs! I have done this and its blooming painful! My only concern is that I cannot find replacement glass for the ISUB G tank, which i will need in the future. How do u fix when it says check atomizer?? You will most probably need to replace the coil in your tank. It may also be a problem with the 510/ego threaded connector. Take it to the store where you purchased it and get them to check it for you. They will also be able to sell you a spare pack of coils as well. Put a tank on. Only says that if no tank on. What did you find were the optimal wattage/voltage settings? Just got the MVP 3.0 pro and having a hard time getting everything balanced. Same here, I am using E liquid VIP usa tobbacco nicotine 2.4 mg.
Hi guys. Can anyone help with my puzzled brain. I have a mvp3 pro and can’t work out y It will let me change the voltage to a higher setting but the but I no the unit maxes out at 60W. which is like 4.1V. So why when I select voltage as the main setting to increase/decrease power. It will let me go all the way to 9V if it has no additional power output? I have the i taste MVP 3 3.0 I am running a .2ohm coil . What wattage setting would be the best to get the most vapor without the burnt taste ? I am currently running it at 40 watts !!! Hi,dont know if this is out of date thread. Im having much trouble with my mvp 3.0 it wont turn on?. Am i doing something wrong or is it faulted. You press power button 3 times yes?. no display will show up nor anything on the led battery indicator when plugged in. Help me pls very frustrated. How do i know if its charging is the led supposed to light up. im so confused. So i purchased a Itaste mvp 3.0 pro 60ww and i have a tank called TFV4 from Smok deos thos tabk goea with it cause i dont know of ots the mod or my tabk but o only take at least 10 hits then the RBA say 00.00 but it usually say 00.14 or 00.15 i dont know what seams to be the problem with my vape and i barely purchased it like a week ago… please help..
be my suggestion. I have just tested this for you and its working fine!